Great for stock tank repairs! It plugs or seals practically anything that leaks. It will patch holes and cracks, and mend almost anything that is broken. It is excellent for rebuilding or fabricating parts, and as an all-purpose adhesive for metals, wood, fiberglass, masonry, ceramics, PVC, and ABS. Permanently repair holes, gouges, cuts ... even seals rot in fiberglass and wood. 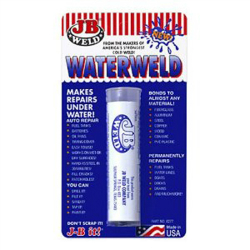 It can be applied under water; surfaces to be repaired do not need to be clean and dry. Waterweld putty "mushrooms" through and around holes, grabbing the edges to hold securely, then hardening for a permanent seal. Approved by the National Sanitation Foundation for use with potable water (meaning you can drink safely from fresh water pipes or utinsels repaired with it).